My love of muffins comes from the fact that they’re easy to make, and you can pretty much chuck in whatever fruit or flavourings you like. 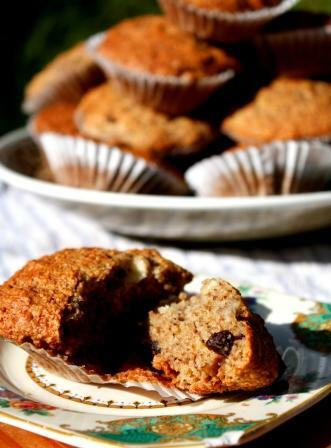 Because this recipe is really straightforward and, frankly, hard to screw up, these oatbran, banana and raisin muffins have become something of a speciality of mine. I’m sure my friends are sick of me wheeling them out at every baking opportunity (although they haven’t complained yet), but they’re a healthy option, as muffins go, and really quick to make. This is another recipe handed down from my Mum, learned from friends when we lived in Canada. It easily doubles or triples up if you’ve got lots of people to feed, and you can alter the amount of sugar, raisins and banana you put in to suit your taste (personally, I like lots of raisins and banana, and not too much sugar). You can also use plain white flour if you really can’t handle wholewheat, but they taste MUCH better with wholewheat. Oatbran is widely available in most supermarkets. 1. Preheat your oven to 170˚C. 2. 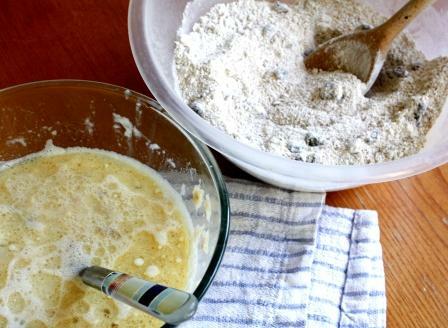 In a large bowl, combine all the dry ingredients and mix well. 4. 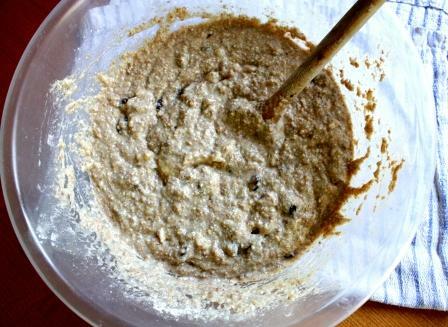 Tip the wet mixture into the dry mixture, and use a wooden spoon to fold together. You want to mix it so that there’s no dry flour left clinging to the bottom of the bowl, but not so much that it’s really smooth. You want a good, chunky texture. 5. Put muffin cases into a muffin tray, then spoon about a dessert spoon and a half into each case. You don’t want to overfill them or they’ll leak all over your oven. 6. Bake until muffins are golden brown on top. In my oven, this took about 22 minutes. You’ll know they’re done by the colour, or by removing one a muffin from the tray and tapping its bottom – it should sound hollow. 7. Allow to cool on a wire baking rack. These taste amazing still hot, but they’re also good cold and will keep around 5 days in an airtight container.